I had a go at charting the global mean temperature trend. An interesting thing to do as it gives you an insight into all those global mean temperature graphs you see. I started off with the GISS temperature anomaly dataset that goes from 1880 up to the present. The temperature anomaly data is provided in monthly intervals based upon a 1951-1980 baseline of 14.0 deg-C, but I really only used the data from 1970 to the present. Using monthly data you see the extremes that sometimes occurr, both on the warm side and the cold side. I added a 12 month running average trend line (red) and a 5 year running average trendline (dark blue) to make the temperature trend clearer. The mean temperature anomaly in January 2008 was just 0.22 degrees variance higher from the baseline, only slightly cooler the extreme mean temperature anomaly of January 1973 of 0.28 degrees. In january 2007 the mean global temperature hit 14.93 degrees, that's an anomaly of 0.93 degrees above the 1951-1980 baseline. We will continue to get these fluctuations on the rising temperature trend. The chart covers the period of two phases of the Pacific Decadal Oscillation (PDO): the positive phase that was kicked off by a weak El Nino in 1977, that saw a rapid rise in global temperatures. The super El Nino of 1998 triggered a reversal to a negative phase of the PDO with temperature anomaly readings reduced to a slight rise. With heat build up in the Pacific ocean during 2014 in the El Nino that never quite happened until just recently (See: El Nino declared as climate scientists watch on with 'amazement'), we could be about to phase shift to the next positive PDO and a rapidly rising temperature trend again, a reprise on what we saw with the temperature trend from 1977 to 1998. 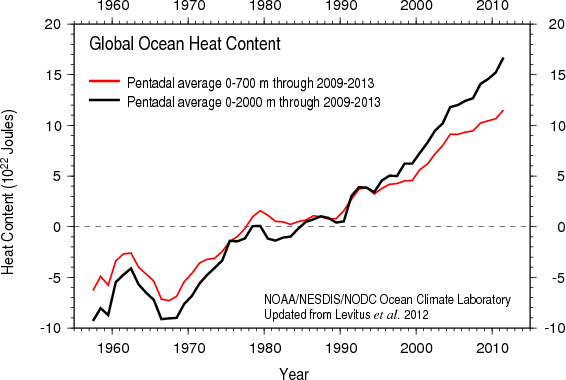 So, after charting temperatures I looked at charting the Pacific Decadal Oscillation. The researchers at Washington State University have put together a dataset of the PDO Index values from 1900 to the present. Once again I charted just the monthly values from 1970 to the present. I also applied an annual moving average and a 5 year moving average trend lines to this data. There is a lot of variability, but you can see the phase shift in 1977 and 1998 and possibly now in 2014-15. Notice how both the 12 month moving average and 5 year moving average started trending up during 2013. During 2014 the PDO Index has been positive and at it's highest level since the last phase change in 1998. While this may be an El Nino influenced blip like in 2003, it may also signal movement of the PDO into a positive phase. We will probably know for sure in the next year or so with more data points. We do know that Warming may spike when Pacific Decadal Oscillation moves to a positive phase, as I described in January 2014. A number of studies have shown the importance of the Pacific Decadal Oscillation (PDO) and Atlantic multidecadal oscillation (AMO) in transferring heat between the oceans and atmosphere. These are long cycle events that occurr over decadal timescales that moderate the earth's climate and act to transfer heat between the atmosphere and ocean. These cycles affect the atmospheric temperature trend. And it looks like we have a phase shift in progress from Negative to positive Pacific Decadal Oscillation. Oceans have always been important in the regulation of temperatures on the Earth. Over 93 per cent of the heating of the earth system is absorbed by the world's oceans. It provides massive inertia in moderating temperature change and climate change. On top of these multi-decadal cycles we have the El Nino Southern Oscillation (ENSO) in the Pacific which occurrs every few years producing El Nino years (positive phase) and La Nina (negative phase) years. These too have a hydrological impact right round the Pacific basin and even further afield, producing low rainfall and drought in some regions and high rainfall and flooding in others. El Nino years tend to increase global atmospheric temperatures and often push us to new global yearly average temperatures. For most of 2014 El Nino conditions were just beneath the threshold. El Nino and La Nina affect the global mean temperature up to 0.1 degree Celsius. It may not seem like much, but it sure packs a wallop. Power et al (2013 found that El Niño is likely to become more intense with climate change, and produce drier conditions for Australia and the Western Pacific, with increases in rainfall in the central and eastern equatorial Pacific in the mid to late twenty first century. McGregor et al (2013) analysed past intensity of El Niño and La Nina events finding that the most recent 30 year period was more active and intense than any time in the last 600 years. Research by Cai et al (2014) showed that global warming is doubling the risk of extreme El Niños. Much has been said about the hiatus in atmospheric global temperatures since about 2001. Global atmospheric average temperatures have been plateauing since then. A slight increase in small to medium Volcanic eruptions and reduced sunspot solar activity has contributed to a small amount of this reduced warming, but cannot explain most of it. The explanation lies in our oceans burying the heat to deeper levels. In previous negative phase PDO, average global temperatures have decreased. We have not seen a decrease this time but with the decadal temperature trend reduced to a slight rise. That should be concerning enough. Professor Andy Pitman argued in 2013 that without extensive global warming we should have seen a decade-scale period of cooling of 0.3C to 0.4C like in similar historical periods. "Between about 1880 and 1890, temperatures cooled by about 0.4C. Between 1900 and 1910 temperatures cooled close to 0.3C. Between 1945 and 1950 temperatures cooled about 0.35C. Between 1962 and 1965 temperatures cooled about 0.3C." Last year, quietly and without much fanfare from the mainstream press, the Pacific Ocean underwent a powerful shift. A shift from a state in which cooler surface waters absorbed atmospheric heat, to a phase in which surface water warming caused ocean heat to be transferred to the world’s already warming airs. The shift was heralded by a powerful oceanic Kelvin Wave. One that brought warm water up from the depths and spread them across the Pacific Ocean surface. Ever since that time, warm Kelvin Waves have continued to refresh this surface water heat pool. As noted by Climate scientist Michael Mann in a tweet in October 2014, there were Record sea surface temperatures in October 2014 according to UK MetOffice data. "Climate scientists have long understood that global average temperatures don’t rise in a continual upward trajectory, instead warming in a series of abrupt steps in between periods with more-or-less steady temperatures." So we have been on a level step the last decade, about to jump up to a new higher level of temperature increase. So what would a positive phase PDO mean for us? Global atmospheric temperatures will rise rapidly for a period of 20 to 25 years similar to the 1977 to 1998 period. We'll get the occasion cool year influenced by La Nina, but El Nino years will tend to predominate lifting temperatures to new records. That will take us to 2036 when it is likely we will start exceeding the 2 degrees Celsius limit according to Michael Mann writing in Scientific American. Data for AMO sourced from NOAA - AMO unsmoothed, short (1948 to present) dataset.